NH Collection Guadalajara Centro Histórico is approximately a 15 minute walk to the famous Hospicio Cabañas, declared a World Heritage Site by UNESCO. Located in the historic heart of Guadalajara, the hotel is surrounded by stunning architecture, museums, and market places. It is situated in a beautiful old building that is a short walk from the cathedral, and close to main avenues that connect to all areas of this vibrant city. A perfect blend of historical architecture and modern comfort, the NH Collection Guadalajara Centro Histórico offers spacious guestrooms, ideal for both families and business travelers. Many offer views of some of the city’s finest sights. Relax in comfort and style in your own beautiful space, with modern décor and amenities such as complimentary WiFi. Guest can also choose from suites, connecting rooms, and extra-large rooms. There are plenty of extra facilities to take advantage of the time in Guadalajara. Unwind after a long day of shopping and sightseeing in the gym. Hold an event or business meeting in one of the function rooms. Or enjoy great food and drinks at the on-site restaurant with views of the city. Explore the city's hidden treasures with the Guest Relations team's recommendations. NH Collection Guadalajara Centro Histórico offers many possibilities for guests. 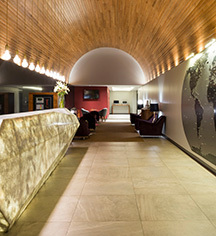 NH Collection Guadalajaro Centro Histórico, a member of Historic Hotels Worldwide since 2016, dates back to 1948. Guadalajara, Mexico is the birthplace of mariachi music and tequila, in addition to being one of the country’s major industrial and business centers. Airport Transportation: An airport shuttle may be arranged through the hotel's concierge, MXN 700 per vehicle (roundtrip). Early Check-In/Late Check-Out: Available, depending upon availability. Complimentary late check-out most Sundays. Parking: On-site parking is not available. Off-site parking is available for a surcharge. Long-term parking is available. Pet Policy: Service animals allowed: Guide dogs only. Pets allowed: No. Shuttle Service: Shuttle service to and from the airport may be scheduled through the resort's concierge. MXN 700 per vehicle (roundtrip). NH Collection Guadalajara Centro Histórico is approximately a 15 minute walk to the famous Hospicio Cabañas, declared a World Heritage Site by UNESCO. Located in the historic heart of Guadalajara, the hotel is surrounded by stunning architecture, museums, and market places. 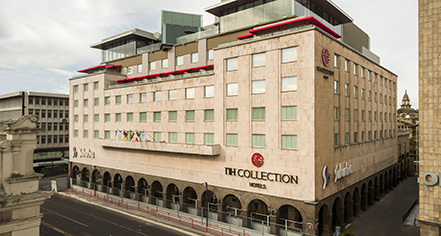 Learn more about the History of NH Collection Guadalajara Centro Histórico .